What is the difference between probation and parole? Probation and parole are similar in that they are both alternatives to incarceration. Probation is a sentencing option in lieu of going to prison. The person is supervised by a community probation officer. Parole is an early release from prison for offenders who still have time remaining on their sentences. A person on parole is still in the legal custody of the state and is supervised by a state parole officer. How soon is a person eligible for parole? A person’s parole eligibility depends on several factors, including the year in which the offense occurred, if it occurred in a drug-free zone, or if it was a violent offense. In the vast majority of cases, offenders are eligible when their calendar time served, plus their good conduct time, equals 25% of their original sentence. Does an offender benefit from having an attorney when seeking parole? Yes. Unlike what you may have seen on television, most offenders never get an in-person interview with members of the Parole Board. The decision of the Board is often influenced by what is contained in the offender’s file, including police reports, reports of probation violations and victim statements. Having an attorney to advocate on behalf of the offender can be a significant advantage. How soon can a parole attorney begin preparing for a parole hearing? Sooner is always better. The parole attorney will need to file paperwork with the Board, to interview the offender, and to create a thorough parole presentation package. Family members will need time to write and gather letters of support. A good rule of thumb is to allow at least six months before the initial parole hearing. How is the parole process handled and who determines whether an offender is granted parole? Prisons in Texas are regionally assigned to one of seven offices across the state. When an offender is eligible to be considered for parole, his or her file, along with any letters of support or parole packages, will be transferred to the applicable office where a voting panel will review the file and vote on whether or not to grant parole. The voting panel usually consists of two commissioners and a Board member. An offender needs two affirmative votes in order to be awarded parole. What is considered when an offender is up for parole? The Board has developed a set of parole guidelines to help them determine an offender’s probability for success on parole. These guidelines include factors such as the offender’s criminal history, employment history, age and the severity of the offense. The voting panel will also consider an offender’s prison disciplinary conduct, whether he or she has participated in vocational or character development programs, and whether the offender’s release plan is suitable for successful reintegration. What happens if an offender gets into trouble while on parole? Parole is a privilege that can be revoked if the parolee does not follow the rules and conditions of his/her release. Sanctions for parole violations can range from a verbal reprimand all the way to revocation of parole. What is a parole revocation hearing? If a parole officer has alleged that the parolee violated his/her parole, the parolee has a right to ask for a revocation hearing. During a revocation hearing , parole officers and parole supervisors provide a narrative of the violation, along with their recommendation on whether to revoke parole or to continue supervision. The wrongdoing must be proved by a preponderance of credible evidence. Who decides whether a parolee should have his parole revoked ? A voting panel at the Board of Pardons and Paroles makes the final determination. Does a parolee have a right to an attorney at a revocation hearing? Yes, parolees may hire an attorney for the revocation hearing. The state may appoint an attorney if the parolee cannot afford one or is not mentally competent. The attorney can present evidence and examine witnesses. Trent Marshall is a veteran attorney with considerable parole law experience. Prior to joining The Marshall Law Firm, he was a commissioner with the Texas Board of Pardons and Paroles. Mr. Marshall was also appointed by Governor Perry to serve as a member of the Polygraph Examiners Board and the Texas Board of Criminal Justice Advisory Committee on Offenders with Medical and Mental Impairments. 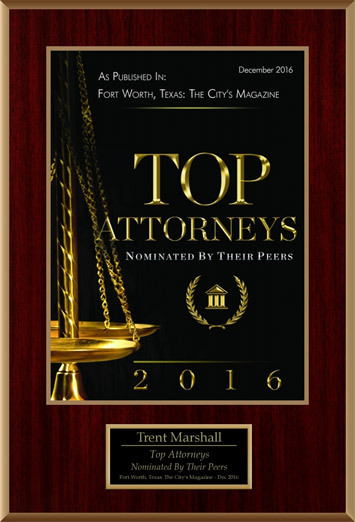 If you would like to discuss your case with Mr. Marshall, call 817-435-4795 for a free consultation.